President Rodrigo Duterte delivers his 1st State of the Nation Address on Monday, July 25. 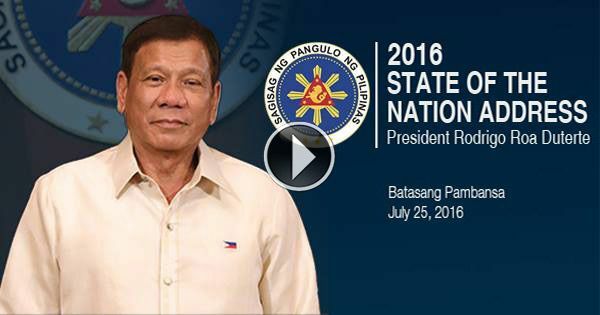 Watch the SONA 2016 live stream and replay here. Duterte's SONA 2016 is expected to be "historic and patriotic." The president will present his achievements so far, including the status of his administration's fight against illegal drugs, and plans for the country as its 16th president. It is also anticipated that he will make a controversial and explosive revelation or announcement. The address of President Duterte will be the 78th since 1935 and the 30th since the restoration of democratic rule under the Fifth Republic in 1987. Watch the 2016 SONA live from the Batasang Pambansa, House of Representatives, Quezon City at 4 p.m. Monday. The video replay will be embedded later.